Who gets to decide who is involved in pseudoscience and misdirection? Who asks the questions and who gets bamboozled? What role should the media play? Times front page, April 14, 2018.The morning after the US-led airstrikes on Syria, The Times devoted its front page to an attack on academics who had questioned the rationale for the bombing. 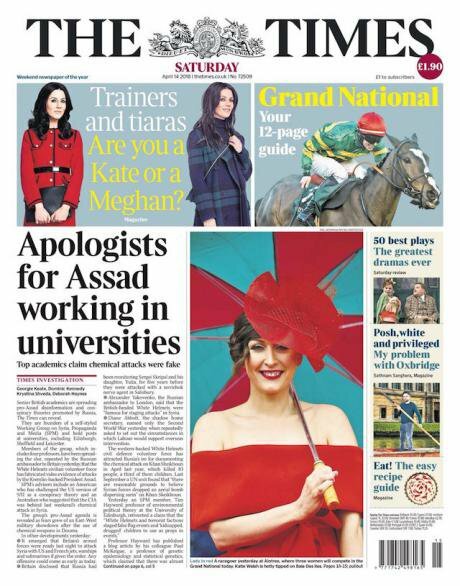 The headline article – ‘Apologists for Assad working in British universities’ – was accompanied by a two-page spread claiming that the academic Working Group on Syria, Propaganda and Media was trying to ‘shut down debate’. For good measure, The Times also denounced the Working Group as ‘Assad’s Useful Idiots’ in its editorial column. A leading national newspaper singling out individual scholars as ‘agents of disinformation and cheerleaders for despotism’ who, it strongly implied, should not be employed at British universities, raises urgent questions of academic freedom. The Times maintained its support for the idea of ‘untrammelled academic inquiry as sacrosanct’, but argued that the work of the Group does not count as legitimate academic inquiry. Instead, it said, this ‘coterie of Assad apologists’ is engaged in ‘pseudoscience and misdirection’, peddling ‘obscurantism’ and ‘sophistry’. These are not serious academics pursuing a ‘search for truth’, but rather ‘agents of disinformation’ whose work is ‘a violation of the ethos of academic research’. I must declare an interest here: I am on the international advisory board of the Working Group on Syria, Propaganda and Media. I can attest that the aim of the group is not to act as ‘apologists’ for either the Syrian or Russian governments. Rather, its aim is to analyse media coverage and critique the propaganda claims that surround the conflict. It should not come as a surprise to anyone that western media have acted as conduits for such propaganda, but don’t just take my word for it. 'Coverage of the Syrian war will be remembered as one of the most shameful episodes in the history of the American press’ says former New York Times correspondent Stephen Kinzer. ‘Coverage of the Syrian war will be remembered as one of the most shameful episodes in the history of the American press’, says former New York Times correspondent Stephen Kinzer, for example (Boston Globe, 18 February 2016). In Foreign Affairs, American professor Max Abrahms has criticised the ‘pro-rebel bias dominant in Western outlets’ helping to promote a ‘pro-regime change narrative’. Veteran Middle East correspondent Patrick Cockburn (London Review of Books, February 2017) has said that ‘Western news organisations have almost entirely outsourced their coverage to the rebel side’, resulting in ‘partisan reporting’ which had presented a complex conflict as a simple ‘battle between good and evil’. Another veteran foreign correspondent, Mary Dejevsky (Valdai, 1 March 2018), says she sympathises with ‘a dissident strain of thinking…which is at odds with the official consensus’, declaring that: ‘we reject, or at very least distrust, the dominant official narrative, which appears designed at once to get the UK and other Western countries more directly involved and to thwart or discredit Russia’. In seeking to close down such dissident thought, Times journalists are acting, not as neutral defenders of truth, but as partisan advocates for a particular understanding of the war. Their view, it has to be said, is a minority one: opinion polls suggest that most people in the UK do not support the government’s air strikes on Syria. Perhaps what lies behind The Times’s self-righteous ‘investigation’ – and the similar one published in The Guardian last December – is frustration at the fact that ‘humanitarian military intervention’ has been discredited by repeated failures, most recently in Libya. Attempting to rehabilitate this tarnished idea seems to necessitate both maintaining the fiction that western states have not been intervening in Syria, and attempting to silence criticism of western policy and of its sycophantic media cheerleaders.